Seun, 36, lost to South Africa's Soweto Gospel Choir who won their third Grammy award, making them the most successful African group in the award's history. The album, 'Freedom', which earned them the Grammy, was recorded in June 2018 as part of the group's tribute to the 100 Years of Mandela celebrations. It featured a selection of South African struggle songs including their version of Johnny Clegg's 'Asimbonanga'. This was released in the United States. 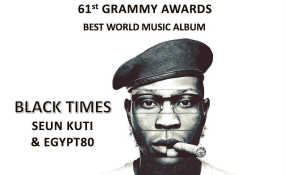 Seun's brother, Femi Kuti, has also bagged four Grammy nominations in the World Music Category.